Don’t Give A Damn can’t carry 64kg to victory at Rosehill on Saturday, can he? Trainer Danny Williams. (Pic: Bradley Photos). It’s been done before and trainer Danny Williams has enough faith in his horse, on a possible Epsom Handicap path, to believe he can be just the third horse since 1980 to shoulder such a weight to win a Sydney metropolitan race. Williams said he thought long and hard about whether the Schweppes Handicap (1400m) was the right move and decided the weight wasn’t the issue. “I’m not frightened of letting them carry a bit of weight,’’ Williams said. “I rode as an amateur before I went professional and we used to ride horses with 64kg or 65kg or more and they were running faster times than in the professionals. “It comes back to the quality of rider on them I think. I believe a horse can carry weight with a good rider provided they are going well and they are fit. “We understand the task ahead with that weight but what have we got to lose? It’s in his program, if he gets beaten he gets beaten. In the last couple of months weeks we’ve seen Williams produce Volpe with 66kg at Goulburn, She Knows won a Highway with 62.5kg and carried 63.5kg to a close second in town at her last start and Arrondissiment was placed at Goulburn recently with 62.5kg. According to records kept by Racing And Sports (see table), two horses have carried 64kg to win a metropolitan race in Sydney since 1980. They are Anthems, trained by John Hawkes, at Rosehill in 1997 and Stanzaic, from the John Size stable, at Randwick on Australia Day 2000. Don’t Give A Damn rises 8.5kg on his impressive first-up win at Rosehill on August 25 and it’ll be a stern test for him on Saturday with third placed Renewal getting a 3kg swing in his favour. 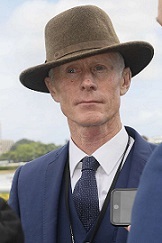 Williams said his plan all along with the gelding was to go to 1400m second-up at this meeting then back up into the Group 3 Bill Ritchie Handicap (1400m) on Saturday week chasing an Epsom exemption. “You can come back in class and carry weight but it is difficult to go up in class and carry it,’’ he said. “It was always my program, and I try not to differ from it if I can. I did nominate for the Theo Marks but the advice was that the penalty, if he ran well, for the amount of prizemoney difference it’s not the way to go. Given Don’t Give A Damn was $2.70 favourite with TAB on Thursday to etch his name into Sydney racing history the question is has he improved since that first-up win. Williams said at the time he was the most forward of his four runners on the day though would still benefit from the run. He clocked the second fastest, by 0.01, last 200m of the race of 11.57 (Punters Intel) so he wasn’t stopping. “He’s really come on since his run, he’s looking like the muscle tone is better,’’ Williams said. “He had a strong gallop with She Knows on Tuesday. The next day he was that pumped and that well, he’s really spot on. “I think he’s better suited at 1400m, I was a bit concerned they may have been a bit brilliant the other day. Don’t Give A Damn is also the equal second favourite at $6 for the $1.3m The Kosciuszko, which will only become an option if he doesn’t prove up to the Epsom. Williams on Highway Sixtysix (Race 2, $3): “I hope JMac (James McDonald) doesn’t fire her out too much. She’s generally brilliant out of the gates so she should naturally have enough gate speed to come across on her own. “I’d like to see James use his own ability, even if he’s three or four wide, to get cover in the first half of the field. Williams on She Knows (Race 8, $8): “Her work wasn’t the best going into her last run, I was of the opinion she was the most vulnerable but her run was outstanding.